Big Grams is coming soon. Yesterday, an official release date materialized for the joint Big Boi/Phantogram project. The collaborators followed that today with the first taste of the upcoming EP. "Fell In The Sun" mixes live-band textures—plenty of horns, backing vocals—with a sturdily-programmed rhythm section. "Fell In The Sun" is the third track on Big Grams. 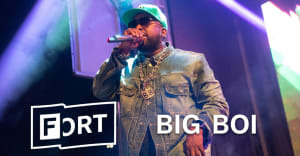 Look for the project on September 25, and read Big Boi's FADER interview.